Seeking opportunities to enhance the effectiveness of joint agriculture research for sustainable development in Vietnam, officials from the Ministry of Agriculture and Rural Development (MARD), representatives of the 10 CGIAR centres operating in the country and key national and international partners met on 18 October 2017 in the second coordination meeting between MARD and CGIAR in Hanoi. MARD’s vice minister Le Quoc Doanh, who opened the event, said that despite the agricultural sector providing the country with USD 32 billion worth of exports earning in 2016, it faced the challenge of coping with a changing climate and global market competition which requires sector restructuring to add more value to producers and ensure its sustainability. 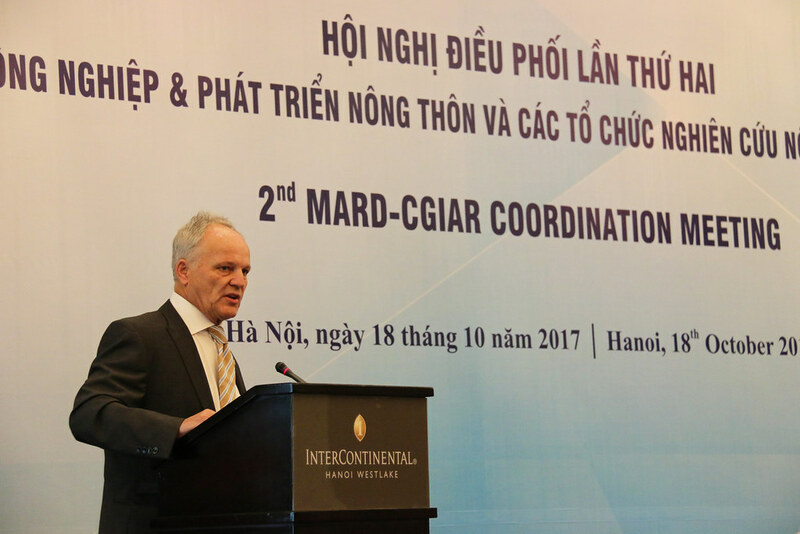 He lauded the contribution of the CGIAR centres role in the development of agriculture sector in Vietnam, and said CGIAR could contribute to addressing the current challenges in the sector. In a keynote address on CGIAR research programs, Dieter Schillinger, assistant director general of the International Livestock Research Institute (ILRI) said CGIAR is committed to providing the scientific underpinnings crucial for Vietnam’s agricultural restructuring strategy in the country, which is one of six focus countries of CGIAR research programs globally. Dieter Schillinger, ILRI deputy director general gives a keynote speech at the MARD-CGIAR coordination meeting on 18 October 2017 (photo credit: ILRI/Chi Nguyen). Jacqueline Hughes, deputy director general of the International Rice Research Institute (IRRI) said that CGIAR’s focus on partnerships will ensure that the 10 CGIAR centres in the country complement the government’s agricultural sector programs. Hung Nguyen, ILRI’s regional representative for East and Southeast Asia said that ILRI in Vietnam is already playing a key role in efforts to enhance food safety management at the policy level in the country. He said that working with a focal person at MARD would boost coordination between MARD and CGIAR and contribute towards a strategic a long-term partnership between the government and CGIAR. Bioversity International, the International Center for Tropical Agriculture (CIAT), the International Potato Center (CIP), the World Agroforestry Centre (ICRAF), the International Rice Research Institute (IRRI), WorldFish and ILRI were among the CGIAR centres represented at the meeting. MARD shared its research objectives and development plans for the country’s agricultural sector, including possible areas of cooperation for 2018-2020. 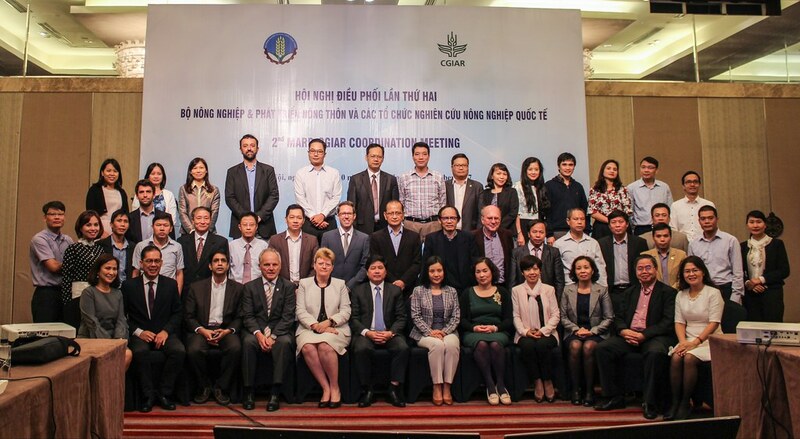 Priority areas of cooperation were identified and CGIAR centres in Vietnam updated the officials on their research achievement and plans in the country. Group photo of MARD leaders and representatives from CGIAR centres (photo credit: ILRI/Chi Nguyen). CGIAR has worked in agricultural research for development in Vietnam for more than four decades contributing to poverty reduction, food and nutrition security for thousands of households in the country. The joint CGIAR research activities in the country are aligned with Vietnam’s 2030 Agenda for Sustainable Development. See more photos from this meeting on ILRI Flickr. Read more about the first coordination meeting between MARD and CGIAR. Tags: coordination meeting, Dieter, Le Quoc Doanh, MARD, MARD Vice Minister. Bookmark the permalink.